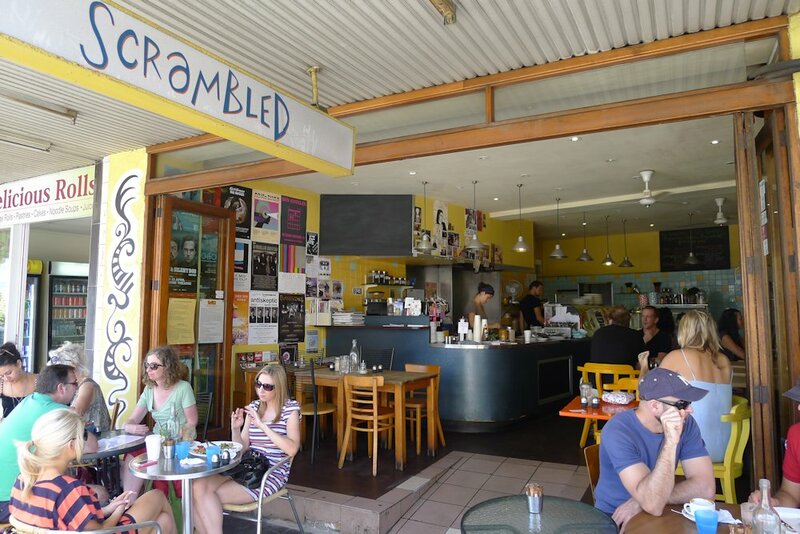 We had read a couple of negatives about the service and slow food at Scrambled but after seating ourselves, we were immediately offered menus and coffees. 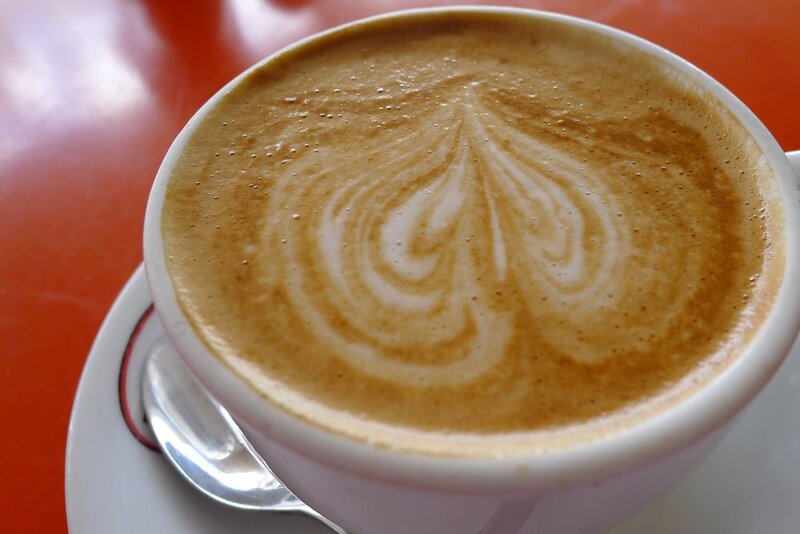 No complaints about the latter – our cappuccino and flat white ($3.20) were both fast & hot and tasted glorious. We especially liked the sign amongst other artwork behind the counter declaring “NO DECAF” with a decidedly perky owl perched on a branch! With such a competent looking drinks menu including offerings such as affogato ($4.50), loose leaf teas (English breakfast, Irish breakfast, Earl Gray, peppermint, chamomile, lemon grass, green, $3.20), frappes (pineapple, mango, mixed berry, fruit salad, $6), smoothies (banana, strawberry, mixed berry, fruit salad, $6.50) and milkshakes/thickshakes (chocolate, caramel, strawberry, vanilla, banana ($5.50/$6.50) amongst others, patrons are definitely not struggling for choice. We opted for a freshly squeezed juice ($5.50). 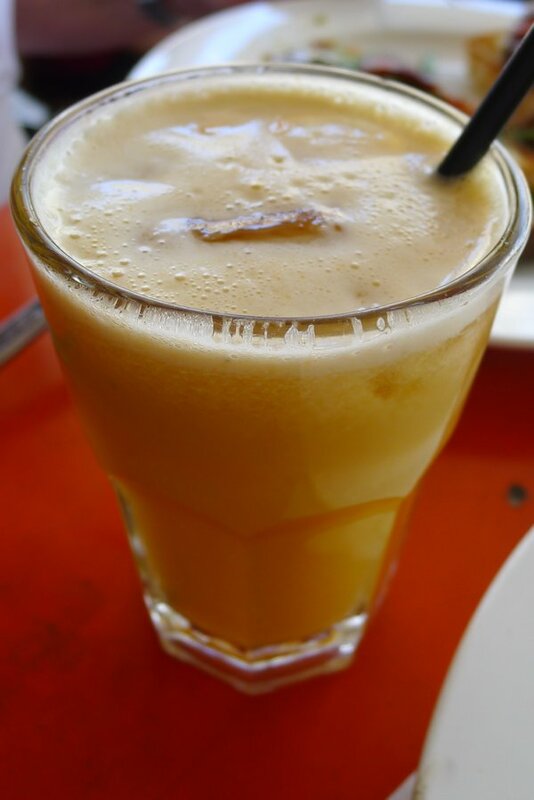 On offer is orange, apple, carrot, watermelon, celery, pineapple, lemon, beetroot, ginger and mint. Our pineapple and mint did not feature very much mint although the size was great for the price and it was served nice and cold. A large blackboard makes for interesting reading as it contains nutritional benefits of various juices. 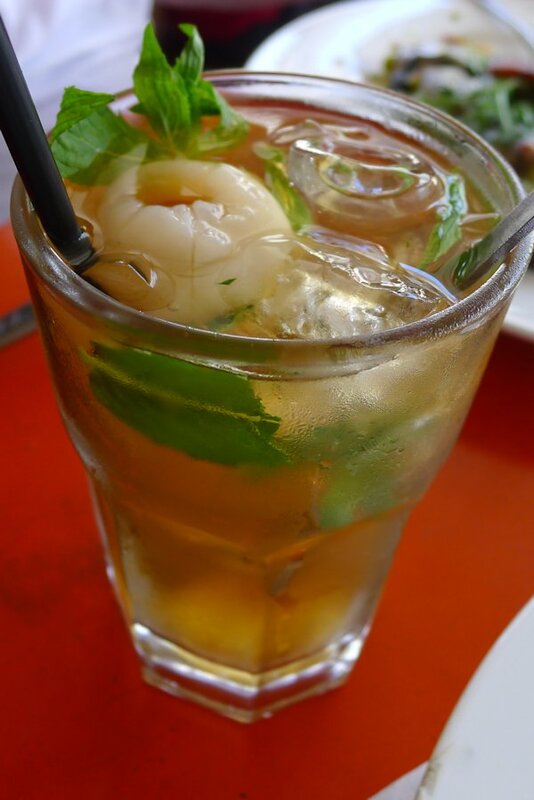 The specials board today contained peppermint and lychee iced tea ($4.90). It was very refreshing although it was more ‘peppermint tea with two lychees’. We would have preferred some lychee flavouring to have been mixed through. When it came to the food menu, we struggled. So many delicious sounding choices promise to confuse even the most decisive person. The breakfast quesadilla ($13.90) we had heard so much about features garlic tortillas filled with homemade spicy beans, topped with poached eggs and avocado. They sound amazing but it gets better: ricotta pancakes with mixed berry compote, vanilla ice cream and maple syrup ($12.90), French toast with caramelised bananas, maple syrup and ice cream ($12.90), salmon stack (smoked salmon poached eggs, roquette and Spanish onions served on garlic Turkish toast with dill aioli, $14.90) and a whole raft of scrambled eggs done various ways. You will have to visit to sample them! I opted for the velvet eggs ($14.50). 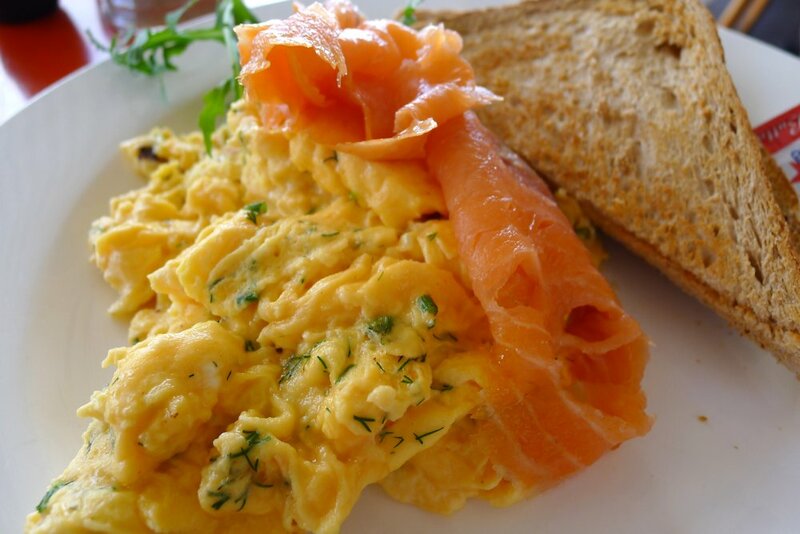 Scrambled eggs mixed with fresh dill and cream cheese served with salmon and toast (of your choice – white, brown or Turkish, spelt Turkish or wheat or gluten free, $1 extra). The eggs tasted fantastic although I forgot that cream cheese was included as I could not detect any. They were slightly on the too well done side but still moist enough. The salmon complements the eggs well although it is quite salty. The eggs had been seasoned with salt as well and although the two tasted great separately, when eaten together I thought that the eggs should have been left unsalted. Over to the lunch menu which is only served from 11:30 however Scrambled graciously allowed us to order from it an hour prior without even mentioning the fact. The menu comprises of melts, salads and burgers. They all sound delicious but we opted for the mega melt ($12.90, half portion $7.50). 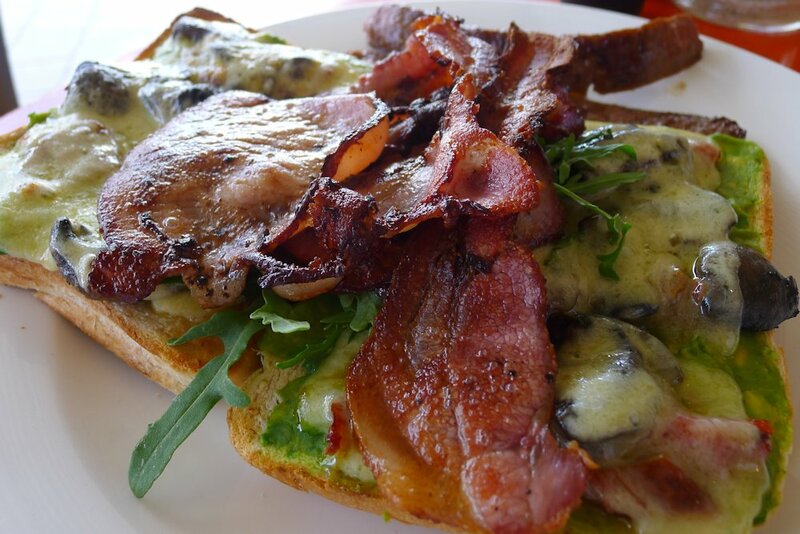 The slices of toast are layered with sundried tomatoes, a copious amount of avocado, fried garlic mushrooms and plenty of melted cheese. We couldn’t believe the very reasonable price for both the full and half portions. We added bacon to the mix for $3.50). There is nothing delicate about this dish. It is all about excess and flavour and it delivered! The combination worked well especially the sundried tomatoes and garlic mushrooms. Scrambled caters for small and healthy eaters as well with rolls, muesli, mini breakfasts and toasts. 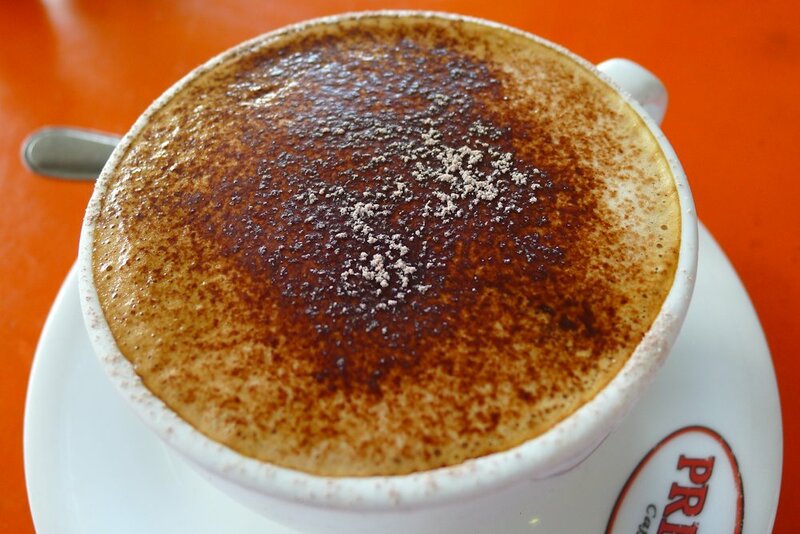 If you need a breakfast fix in the area, this is definitely a place to try! 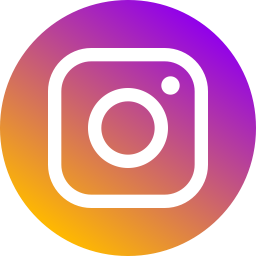 This entry was posted in Sydney - Inner West and tagged Dog friendly, Free range eggs, Fresh fruit and vegetable stores close by, Gluten free options, Organic Options, Outdoor seating, Reasonable prices. Bookmark the permalink.